Many people throughout the ages are considered visionaries because they see in their mind, through the eye of faith, what others cannot. They view the impossible as possible. These visionaries are simply people who have learned how to utilize the eye of faith to their benefit and to the benefit of others. One such visionary was Ronald Reagan, the 40th President of the United States. Ronald Reagan understood the principle of faith and visualization and used it throughout his presidency. It was one of his defining qualities. Reagan used the eye of faith to achieve what no one thought was possible. In 1961 when I was only 3 years old the Berlin wall was constructed. This wall separated the free people of West Berlin in Germany from the oppressed people living in East Berlin. This was a city divided. And this wall, between freedom and tyranny, became symbolic of Soviet oppression. On one side existed the happy, hopeful, vibrant, prosperous people of West Berlin. On the other side existed the downtrodden, hopeless, oppressed miserable, people of East Berlin. The differences between freedom and oppression were never more stark as demonstrated in this once unified city. Reagan understood the American dream. He understood that America was a beacon of liberty to people all over the world – people who wanted to immigrate to America where they could live the American dream. The American flag symbolizes to all nations a system of justice and liberty that allows anyone the opportunity to realize their individual dreams and destinies. Nations all over the world, look to America as a pattern for establishing the principles of freedoms in their own countries. Reagan’s vision of America as a city on a hill is undeniable. President Reagan recognized that in every man, woman and child exists the longing to be free. As an inalienable right, God instilled within us the “desire” to be free and the desire to abide by the dictates of our own conscience. 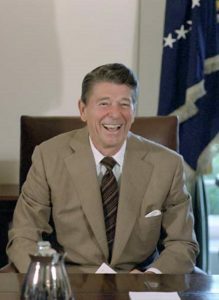 Reagan also understood that America played a key role in extending that hope to other nations – especially the oppressed nations of the Soviet Union. So in 1987, when an opportunity to speak to a crowd of West Berliners staged in front of the Berlin wall occurred, Reagan took that opportunity to do what no president has ever done before. Against the advice of his speechwriters, Reagan included in his speech a key phrase that his editors kept removing. Each time Reagan reviewed the edits, he reinserted the phrase. His advisers became alarmed. They thought Reagan would be foolish to include such incendiary language in his speech. But Reagan had a vision of what could be. Through the eye of faith, Reagan could see the realization of his heart’s desire. He could see a unified Berlin. He could see the city no longer divided by the wall of oppression. His heart’s desire was to see, not only the demise of the Berlin Wall, but with it, the collapse of the tyrannical ideology behind the wall. And thereby, the peoples of East and West Berlin and both Germanies would once again embrace each other in freedom and unity. It was like the shot heard ’round the world. Few times in history have the actions of one man changed so much. In those 6 words, Reagan changed the world forever. In those 6 words, the idea of the American dream was successfully communicated to every nation of the Soviet bloc and the entire world. Miracles can occur when the emotion of our heart’s desire is coupled with the power of the eye of faith. Jesus said faith can remove mountains and Reagan proved it can tear down walls. Ronald Reagan had a clear vision of his heart’s desire – uniting East and West Berlin. Through the eye of faith he envisioned the impossible. However, Reagan knew that all things are possible to those who believe. Faith is an overpowering belief sufficient to visualize big dreams and to motivate one to take massive action. I’ve experienced the process and power of visualization in my own life. It is a powerful force that can change your life. You can read about my personal experience to gain more insight about visualization. Before you can visualize the impossible, you must believe in your own capabilities. You have divine abilities, talents and traits unlike anyone else. No one is like you. And no one can do what you can do. You have to believe in yourself and your ability to succeed. Once you believe, then you can visualize that success in your mind’s eye and then, the possibilities are endless. That’s the power of faith and visualization. For additional information and instruction on the eye of faith, visualization and divine destiny, please join the Living the American Dream Community. Previous Post:How Do You Know the Purpose of Your Life? Very interesting point of view. I learned a lot! Thank you! Thank you. Please come back whenever you like.